Okay, okay, I know it’s Thursday, but Wednesday got a away from me and I really wanted to post this as a Wednesday Reads. So…here goes. Back in 1945, a brand new destructive device had just been discovered, which resulted in the end of World War II. The Atomic Bomb fell on Nagasaki, Japan. The unbelievable power of the bomb was constantly on everyone’s mind. People were still trying to cope with its massive destructive power and existence. Five months before this fateful day, my father’s draft notice arrived in our mailbox. As a boy of 6, that day was one of the saddest and scariest days of my life. I cried uncontrollably because I knew of the many soldiers being killed in action, and I, naturally, was afraid my daddy would not return to us. I was devastated by the thought that I might never get to see him again. While Dad was in training at a base near Macon, Georgia, life for us seemed to be in a holding mode. We lived in a small (very small) house trailer next door to my uncle’s home. Since we didn’t have a car, people came and picked us up for church on Wednesday nights. Sometimes we walked the two miles to church, but fortunately, someone would always give us a ride back home. The radio was on constantly so my Mom could stay updated on the war situation: our country’s victories and defeats in the various battles. One of the saddest days during the war was the day that President Roosevelt passed away. Obviously, this added anxious concerns to all the grown folks, and naturally it trickled down to us children. What would happen now? As history writes, Vice President Truman became President. And he was the one that authorized the use of the Atomic Bomb. When the news of Japan’s surrender came over the radio, my sister, Brenda, and my little brother, Michael, and I jumped with joy over and over on our Mom’s bed. And for the first time ever, she did not stop us. I was in the first grade at the original Youngstown Elementary School in Youngstown, Florida. Back then no one in that area had a telephone so the only communication available was the U.S. mail. It was slow and we had heard nothing from my Dad, but we had heard on the radio that a lot of the soldiers would be coming home. Naturally, we hoped Dad would be one of the first to be discharged. Back then Youngstown had a train depot. Our very own steam engine locomotive stopped at 10 a.m. each day on its way to Panama City, Florida after departing from Dothan, Alabama. We were positive that Dad would be arriving by train, and I wanted to be at the depot when he arrived. As unthinkable as it may seem today, at the age of 6, I was allowed each day to leave the classroom and walk to the depot in time to be there when the train arrived. The depot was about a half mile from the school. I made this trip day after day, but Dad never arrived on the train. As I made the trip each day to the depot, I came away disappointed because he was not there. One day I saw three men get off and start walking to the nearest store. One of them looked a lot like my Dad, but I was not positive. I began following them and finally got up the nerve to call out “Dad” several times. The man never turned around or acknowledge my call – he was not my Dad. Is Dad ever going to come home? I was so discouraged because the waiting seemed endless. However, early one morning I heard a fantastic and familiar voice, my first thought was “can that be my Daddy”? Yes, it was!! He was calling me by name as he came into my bedroom. Dad was finally home! His booming voice was one of the sweetest sounds I have ever heard. For the first time in many months, I felt safe again. It wasn’t the train that brought him back to me but the late night bus. That morning, I lost myself in his great big bear hug. A short time after my Dad arrived home, we moved to Chipley, Florida where my Dad’s parents lived on a farm. Those days were filled with fun and excitement partially because some of my cousins lived close by, and we had a terrific time doing things together such as fishing in a small stream that was on the farm. While Dad helped Papa do the farming, we would sneak off to the hay loft with several of Papa’s burlap bags, which he cherished for some reason, and cut them with scissors to make western chaps like the cowboys wore. We played cowboy and indians for hours upon hours. My family was all together again, and my heart found safety and contentment in this. Granny, as her grandkids called her, and my Mom cooked wonderful meals each day for lunch. The men would come in from the fields at lunchtime and enjoy fresh peas, corn-on-the-cob, cornbread, biscuits, fried chicken or pork chops. Of course, we always had plenty of that freshly brewed and highly sweetened Southern iced tea. About two years after the war ended, the U.S. wanted to test another bomb somewhere on a remote, uninhabited island. This bomb was to be much more powerful that the ones dropped on Japan. Even more interesting was the fact that a live radio broadcast would be sent out from a from a ship some distance from the island and bomb. It is funny today, but back then some grown folks were still not sure of sitting by the radio when that bomb went off. I remember the battery operated radio was sat outside the house on Granny & Papa’s front porch. My cousins, Sherill and Jerry, and I were in the front yard listening to the radio as they were discussing the nearing of Zero Hour and the bomb exploding. Uncle Sylvester pleaded with his boys to get away from the radio: “Back away from the radio! You don’t know what might come through that radio when that thing goes off!” The count-down began. 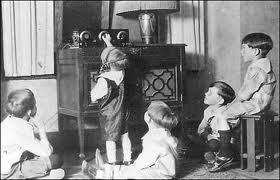 Ten, nine, eight, seven, six, five, four… Uncle Sylvester continued to plead with his boys to get away from the radio. Three, two, one —– BOOM! Each of us stood there waiting. Finally, we took a deep breath realized that nothing happened to us. Folks like to say the Big Bang happened millions of year ago, but the one that I remember boomed over the airways of our little radio on a front porch near Chipley, Florida. This entry was posted in Memior on May 2, 2013 by aliciachall28. Didn’t realize something like this that was in the back of my mind after 67 years would be interesting to anyone. It was a period in my early life where there we so many conflicts and changes. Thankfully they all turn out good. Thanks for honoring me with one of my memoir’s in your fantastic blog that I always enjoy reading.